Description: Aluminum stove top coffee maker of robust design with a pressure release valve and a rubberized handle. Pros: Nice and sturdy classic design. 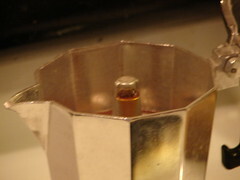 Enables anyone to make good coffee/espresso at home at a low cost. Cons: It can be a little tricky to replace the rubber seal and clean it properly. Conclusion: This small stove top coffee maker makes good coffee using a very simplistic method. We have utilized this pot for a while now and we haven't had any problems. The coffee takes about 4-5 minutes to "brew" and the handle stays nice and cool. This kind of pot and can be found in most kitchen stores for a very reasonable price.